Cruising Overview: This year we face more uncertainty in our cruise plans than normal. Many marinas in our cruising grounds were damaged, some destroyed, by Hurricane Florence. Of those in operation, some are at less than full capacity, and all have absorbed more boats than normal to accommodate those displaced elsewhere. As a result, cruise leaders are modifying plans. We may be rafting up or anchoring out instead of docking. Normal itineraries will change. What is described in this yearbook stands a good chance of being modified. As cruise dates approach, you may contact the cruise leader for the latest plan. Your patience and understanding are appreciated. Impromptu Raft-ups: Raft-ups occur in the Inner Harbour or nearby anchor­ages. Bring your own beverage and an appetizer to share. A few days before each event, the organizers will provide the date, location, and schedule to yacht club members by FHYC e-mail and/or the Facebook page. Sock Burning: Sock burning is a Down East tradition held near the vernal equinox. As the days begin to get longer and warmer, it is said avid boaters quit wearing socks with their boat shoes, socks that may not have been washed all winter. Rather than try to salvage these crusty relics, they burned them. In FHYC we gather at Red Sail Park, have a splash, and burn our socks. It’s good fun and an excuse to get together, share refreshments, and swap tales. Blessing of the Fleet: In conjunction with, and just before the Commissioning Day ceremony, FHYC conducts a boat parade and blessing of the fleet. We gather in the Neuse River near day mark 1N and, led by the Cruising Captain, we parade into and through the Inner Harbour. Members of the clergy bless each vessel as it passes the Shoreline Marina docks. It’s a wonderful way to kick off the boating season. Shakedown Cruise: This two-night event is the first cruise of the season. 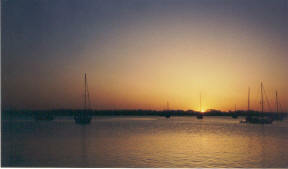 After a day on the river, boaters dock at the marina or anchor nearby. Depending on marina availability, we may include a splash and a potluck dinner on the dock the first night and a catered dinner on the second. Wine Tasting Overnight: We cruise to Oriental where we have a wine tasting on the deck. Dinner follows at the Toucan Grill at the Oriental Harbor Marina. Cape Lookout: Enjoy one of the most spectacular anchorages and unspoiled beaches in the bight at the Cape Lookout National Seashore. In addition to planned activities, there is plenty of time to beach comb, visit the lighthouse, watch the sea turtles, and take a swim. 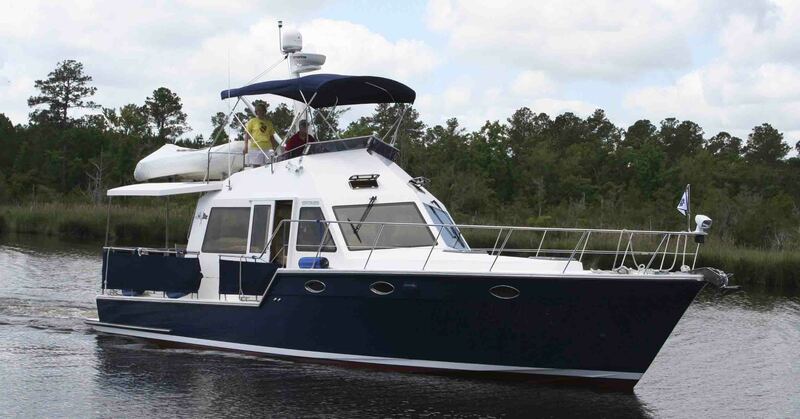 We typically take two days going so that we can time our passage through the Beaufort Inlet with a favorable tide. Returning can take one or two days depending on tides and boat speed. A dinghy is recommended. Ocrafolk Cruise: This May/June cruise coincides with the Ocrafolk Festival. Arriving early for this event is recommended, especially if you hope to stay at the National Park Service docks. Ocracoke is a lovely little town on the Outer Banks, accessible by boat, plane, or ferry. The town is built around Silver Lake, which offers a protected anchorage, commercial marina slips, as well as the National Park Service docks. It is a great town to explore by foot, bike, or golf cart. Latham-Whitehurst Park: This is a one-day, small-boat outing. Take your shal­low-draft boat, dinghy, kayak, canoe, or whatever, up Upper Broad Creek to Latham-Whitehurst Park where we will picnic. You are welcome to drive to the park and walk the ½ mile trail from the parking lot to the dock and join in the picnic. 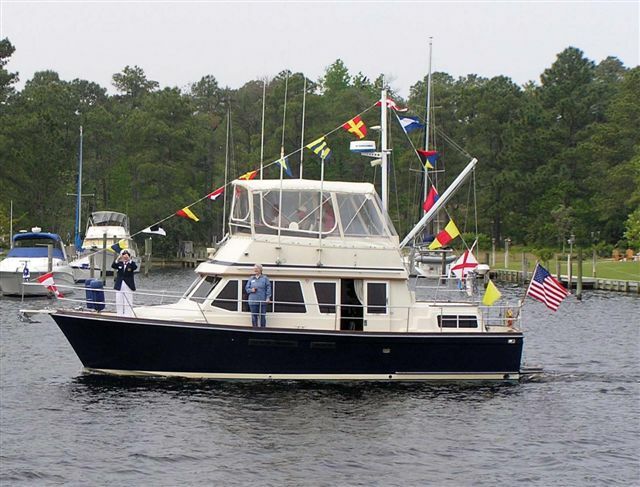 Fourth of July Fireworks: If a marina is available, we will cruise to the New Bern area for two nights to celebrate the Fourth and watch the fireworks. On the first night, there will be a splash on the dock followed by dinner on your own. On the Fourth, we'll have a splash, potluck dinner, and then watch the fireworks. Land cruisers will, of course, be welcome. If no dockage is available, this may become a one-night event with a raft-up in the river and a splash on one or more boats before the fireworks. Christmas in July Boat Parade: In conjunction with the Entertainment Commit­tee event, we decorate our boats and raft up in the Inner Harbour. Shortly after sundown, we circle the Inner Harbour with our displays lighted. Manteo/Ocracoke Cruise: This cruise will be ten days, including two days in Manteo and two in Ocracoke. 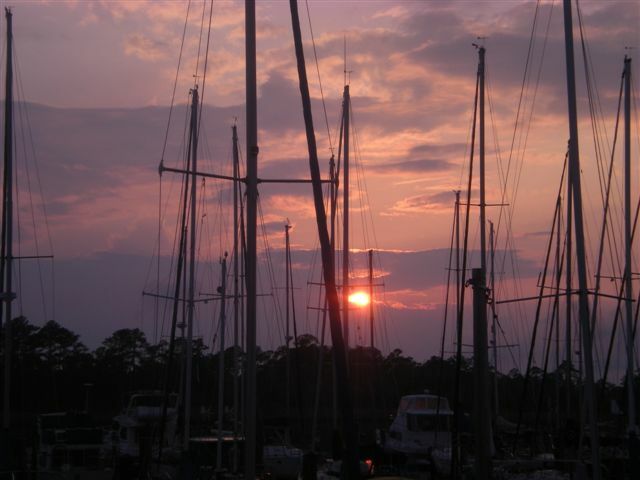 On the way to Manteo, we will attempt to have both marinas and anchorages available. There are many things to do as well as many good restaurants in Manteo. The trip from Manteo to Ocracoke will be one long day. In Ocracoke, we plan to stay at the National Park Service docks or, as an alternate, anchor in Silver Lake. There are many places in Ocracoke to eat, imbibe, or explore. Heading home, we will have a choice of returning in one day or anchoring in South River overnight. Some dinners out and group activities will occur along the way. 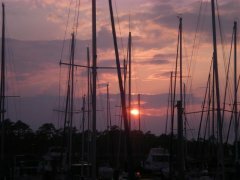 Bald Head Island: We will spend three nights transiting, so the days are doable even for slower boats. Stops along the way will be dictated by marina availability. We plan to stay on Bald Head Island for two nights to enjoy what the island has to offer. There are bikes and golf carts to rent to get around the island. We are planning on ten boats for the trip. The return trip will be either two or three nights. Three-Dinner Cruise: This cruise runs from Thursday to Sunday. Over the three nights, we stop at marinas with a restaurant on site or within easy walking distance. Most venues also offer the opportunity to anchor. Stops may include New Bern, River Dunes, Oriental, and/or Beaufort. 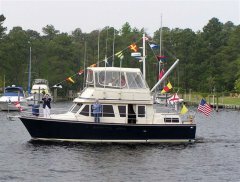 Pamlico Cruise: Cruise north for nine days into the Bay and Pamlico Rivers. Possible stops include Lower Broad Creek, River Dunes, Bath, and Washington. We may also be able to visit friendly Pamlico Plantation for a joint barbecue.